Grand bargains are not likely to end the security gridlock on the European continent. Instead, small steps can be a way out. 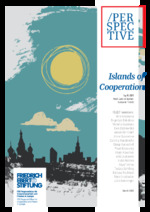 By building Islands of Cooperation – areas of common challenges and converging interests – states can resume interaction and gradually restore mutual trust. In the long run this approach may help find regional answers to fundamental challenges we face. The paper is a result of joint work by a ROCPE-initiated group of young experts from across the OSCE, called FLEET (Fresh Look on Eastern European Trends).